The items I received were complimentary and I was compensated for my time to review this product. However, I was not required to write a positive review and all opinions are honest and 100% my own. This post contains affiliate links. Please see my disclosure policy. Summer is approaching and with it come long days and playful children. Hot days with active kids can equate to a momma feeling a wee bit tired, especially when she’s been up since the crack of dawn with children who awake at the first light. Simple activities that keep the kids happy, occupied, cooled off and even better, learning, are greatly welcomed. 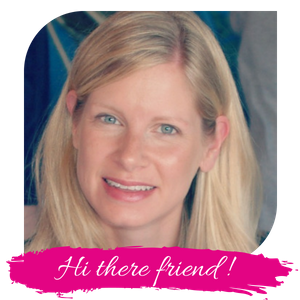 Thankfully, for us mommas, there are some toys and activities to help us out. 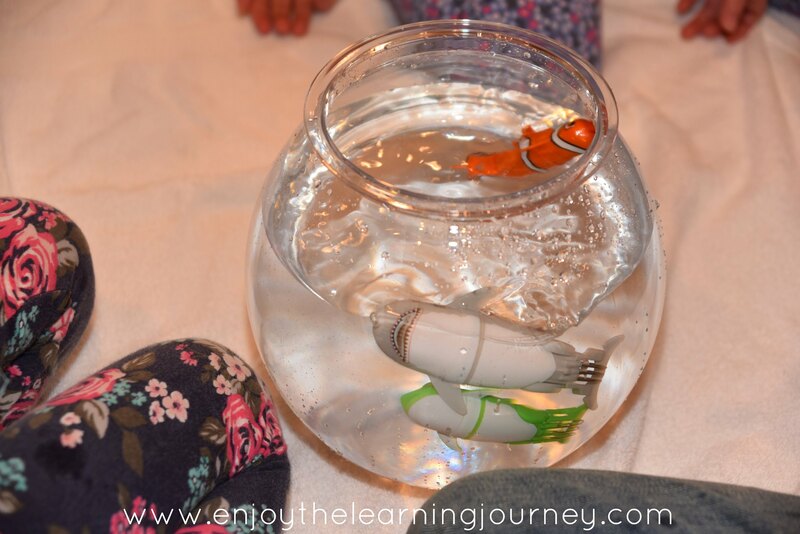 Lil’ Fishy’s motorized pets are cute and fun with the ability to keep our kiddos engaged this summer! 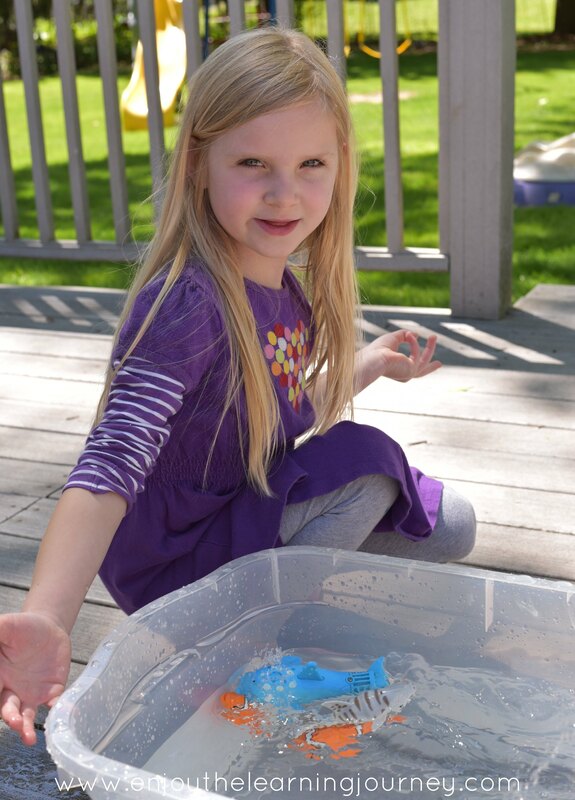 When my twin girls were preschoolers, one of their favorite summertime activities was to play in a bin of water on our outside deck. We didn’t have a water table and I didn’t want to spend the money to purchase one, so I just filled up a clear bin with water, put some toys in it and the kids would spend huge amounts of time playing in it. The very first thing I thought of when I saw the Lil’ Fishys toys was that bin of water. But the first day we got our Lil’ Fishys it was pretty chilly outside. Since the kids wanted to immediately check out these awesome little toys, we set them up inside with the fishbowl and a smaller bin. I just put some towels down underneath which soaked up the few minor water messes we had. All three kids were thrilled with these little toys and stayed engaged playing with them for hours! 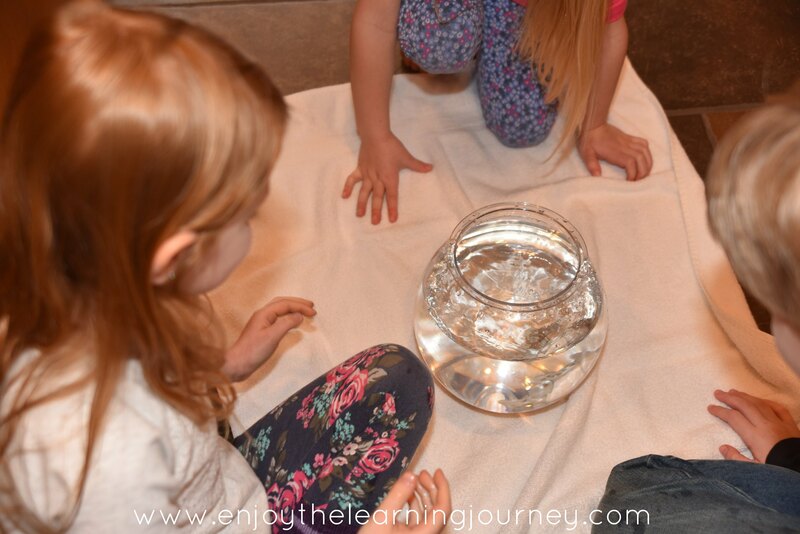 As the fish are put into the water the girls squealed and giggled watching them swim and swirl and jump. Sometimes the fish got into a rhythm and swam together! A couple even spouted water out of the top. Our towels underneath the bin soaked up the minor water mess with no problem. Once the weather warmed up for us, I set up a larger bin of water for the kids to see what would happen. Even though my children are now ages five and eight and no longer preschoolers, they still had fun with it! 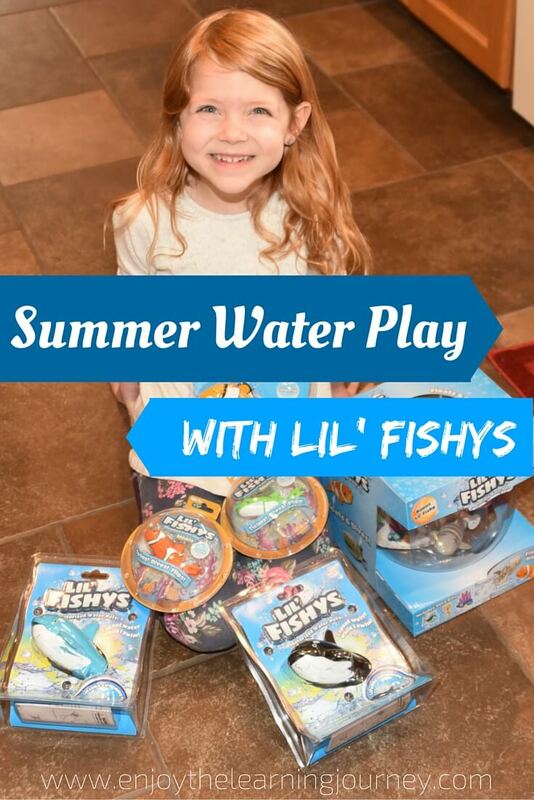 Lil’ Fishys are an excellent addition to our summertime toys and we are looking forward to taking them to the pool as the weather warms up even more. 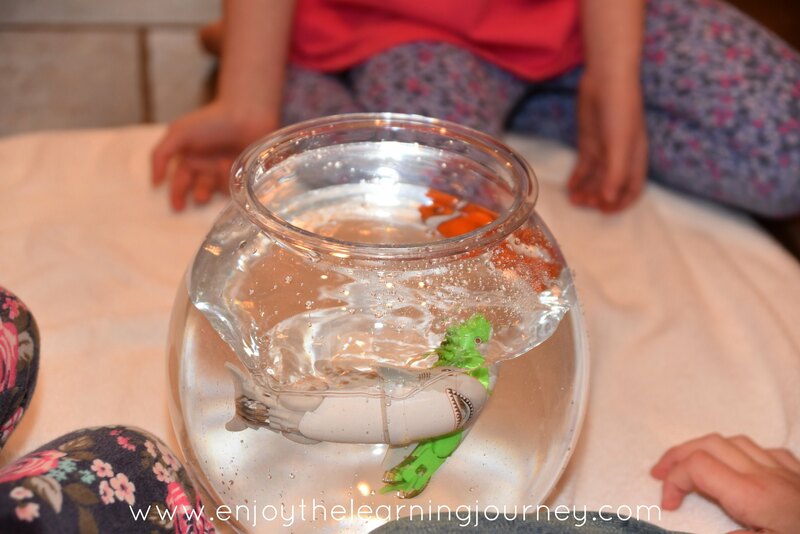 My children have had so much fun with their Lil’ Fishys and have played with them for many hours already. If you decide to purchase any for summer water play or bathtub fun, just make sure you have plenty of AAA batteries available. You can burn through those fairly quickly when your kids are playing with the Lil’ Fishys for extended periods of time. Also, be prepared with a small Phillips screwdriver since you will need one to get the batteries into your Lil’ Fishys. Right after we got our Lil’ Fishys we had the awesome opportunity for a family vacation and some time at the beach. Surrounding that wonderful trip we worked through a unit on the beach and ocean. This unit accompanied the Five a Row book, Gramma’s Walk (more to come on that). 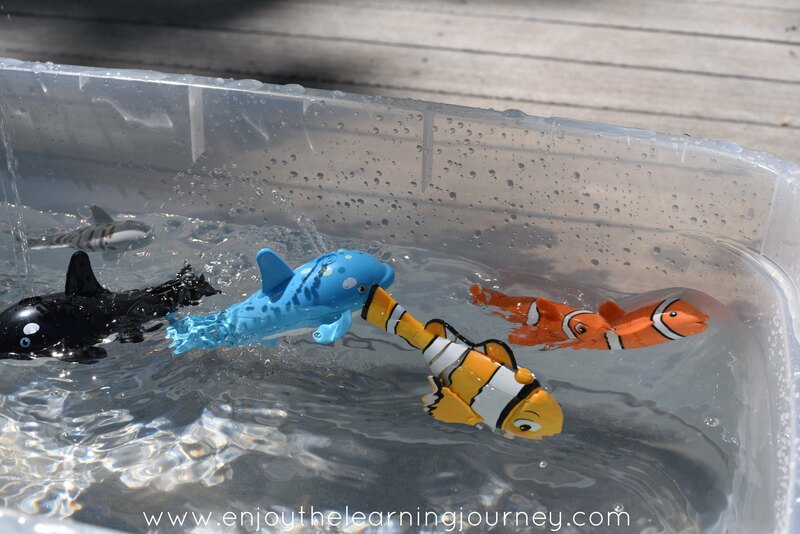 Lil’ Fishys toys were the nice addition to this unit as we talked about sea life! 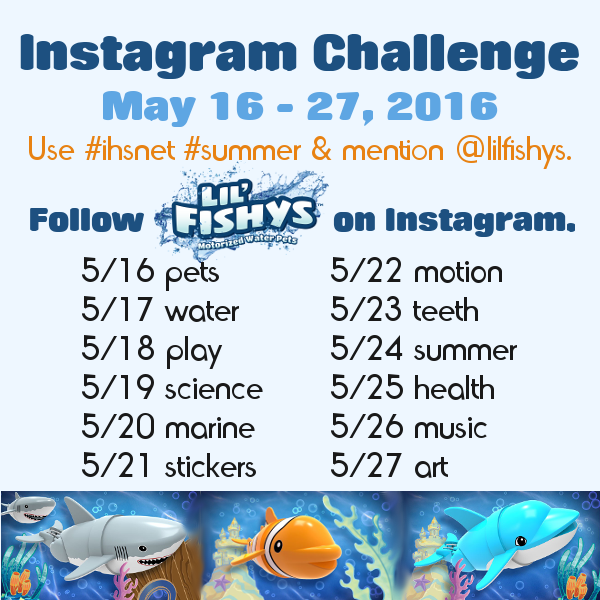 For more information about Lil’ Fishys, be sure to follow them on Facebook, Instagram and Twitter. You can go to the Lil’ Fishys website for free coloring pages and a full list of available products and retailers. You can also find Lil’ Fishys on Amazon. There is a fun Instagram Challenge going on right now and we’d love for you to join us! 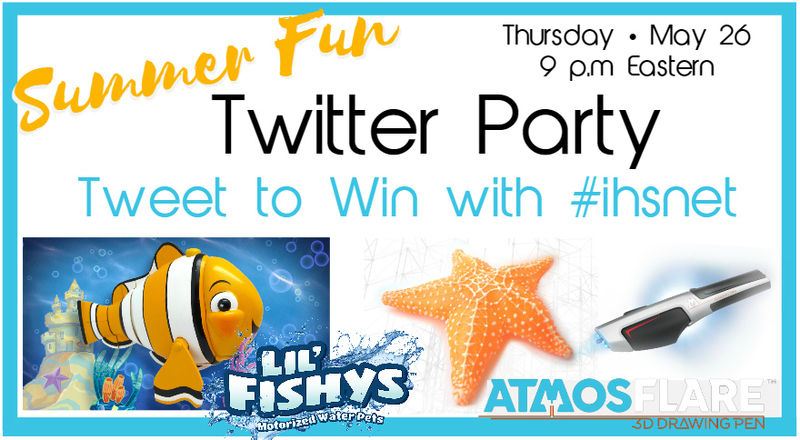 You can also join us for the upcoming Summer Fun Twitter Party! 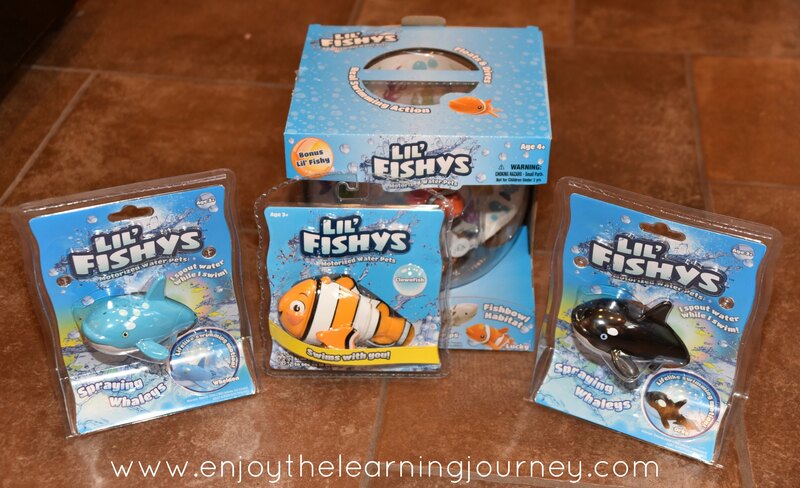 And be sure to enter to win a Lil Fishy Aquarium and a grab bag of Lil Fishy toys! This giveaway is open through 5/31/16 and 3 winners will be chosen!